Excel-based templates for multi-year financial projections (P&Ls, cash flows, balance sheets, ratios & charts). Sixteen versions/editions. Excel-based templates for rolling 12-week and 12-month forecasts (cash flows plus P&Ls, balance sheets, ratios & charts). Six versions. Want a Better Business Plan? Use Free-Plan, a comprehensive Word-based template with extensive help and guidance. Excel templates for comprehensive financial projections (P&Ls, cash flows, balance sheets, ratios & charts) for 3-5-7 years ahead. Details Downloads Excel templates for projecting cash flows and improving cash management. With rolling 12-month and 12-week forecasts (cash flows plus P&Ls, balance sheets, ratios & charts). Comprehensive Word-based template for preparing a detailed business plan for start-up or established businesses. With extensive help & advice. Detailed 20-page guide to preparing a business plan with page-by-page and section-by-section advice and help. View guide Free online tools for preparating (i) a 3-page strategic plan and (ii) a 'first-cut' business plan for all sizes and types of businesses. Range of free tools for financial projections, cashflow forecasting and strategic/business planning. Details & downloads Papers on getting business ideas, devising strategies, strategic plans, writing a business plan, making projections, forecasting cash flow and more. View papers Business planning tips, online surveys and results, checklists for business planning and improving cashflow, and monthly planning calendars. Details Extensive selection of quotations about many aspects of business, enterprise and money along with many examples of bad advice. View items Contact details, about PlanWare and privacy statement. 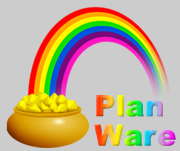 PlanWare, Cashflow Plan, Exl-Plan, Quik-Plan, Free-Plan, Biz-Plan, Easi-Plan, Cash-Plan, Pers-Plan, Your-Plan and Bank-Plan are trademarks or registered trademarks property of Invest-Tech Limited. Microsoft, Word and Excel are trademarks or registered trademarks of Microsoft Corporation. © Copyright 1999-2018. Invest-Tech Limited. All rights reserved.